Are you a foodie looking to share your favorite recipes? Or have you recently launched an eCommerce store dedicated to cookbooks and kitchen products? Maybe you just want to showcase your best food creations with those that share a passion for all things tasty? No matter the reason behind your love of food, the best thing you can do for your WordPress website is layer it with a functional food theme designed specifically for the food industry. With features such as inbuilt recipe layouts, ingredient post templates, menu templates, and recipe plugin support, sometimes you need more than just the typical blogging theme. 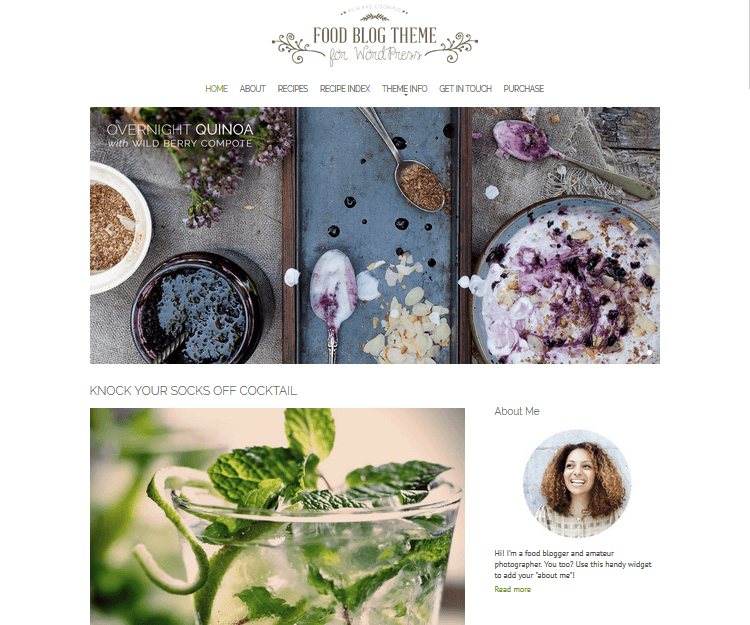 That’s why today I am sharing with you some of the best premium and free food WordPress themes that will inspire you to throw on your apron and get into the kitchen…and then blog all about it! Skip ahead to free food WordPress themes. Meridian Recipes is a stunning, feature-rich theme option for the serious food blogger. This theme is incredibly customizable, with many different modules to choose from and tons of color options. And with its own 5-star rating and bookmarking system, your visitors can create an account and easily keep track of their favorite recipes. Other great features include print-friendly recipes and distraction free cook-mode, so your readers won’t miss a step. 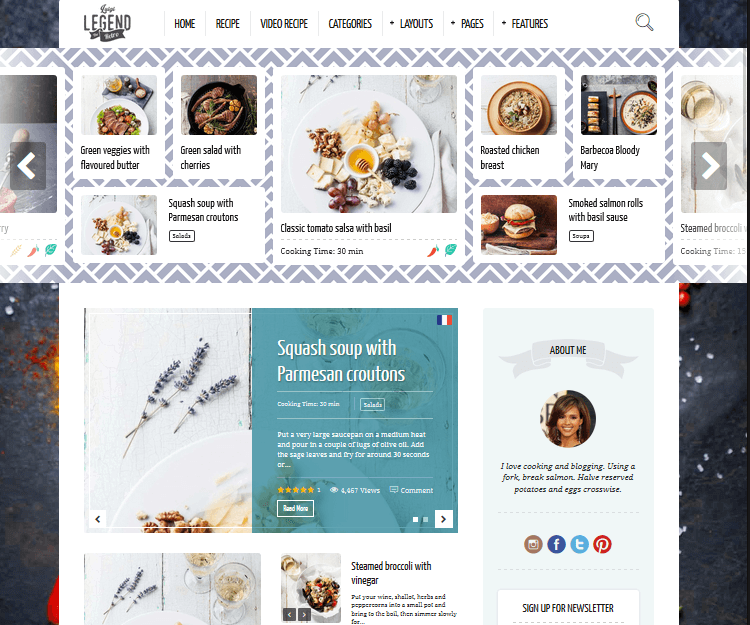 This theme makes it easy to build a quality, professional looking food blog from scratch – no coding or design skills needed. 19 different modules so you can create a unique website that stands out from the other food blogs. Customization made easy with the MeridianStyler feature – colors, typography, background and more. 5-star rating and bookmarking system, complete with user profiles so your visitors can keep track of their favorite recipes. Distraction free cook-mode removes distracting elements from the page so your reader won’t miss any essential steps. Include an email opt-in form on the homepage for list building. Wonderwall is primarily designed for magazine themes and blogs, making it an ideal option for those looking to start a food blog and share their favorite recipes with site visitors. 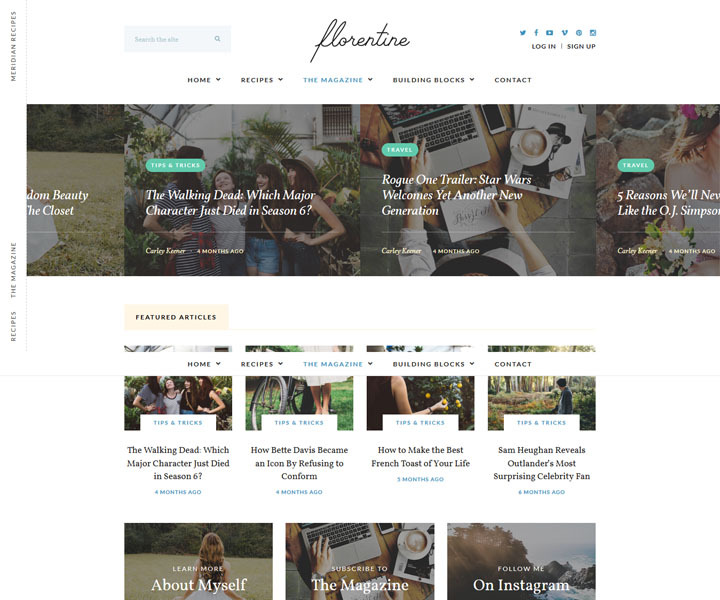 This feature-packed foodie theme is going to have everything you need to not only share ideas with site visitors, but monetize your blog as well. For example, it supports several eCommerce platforms for creating an online shop. In addition, there are integrated banner ad locations for using with Google AdSense or Media.net so you can supplement your income and encourage site visitors to buy only the best stuff. Lastly, include social follow buttons complete with follower counts for a bit of added proof. Altogether, if you are looking to build a complete food website, Wonderwall is one of the best available food themes out there to choose from. Foodie Pro, built on the high quality, SEO-friendly Genesis Framework, is a great food theme option for those serious about their foodie website. It is clean and minimal, but packs a punch with color options, a widgetized homepage complete with thumbnail images, and exclusive recipe pages. Create a customized mobile menu for those on the go, include large featured images, all while staying modern with ample whitespace. This food theme makes it easy for any food blogger to get their website up and running. 6 layout options so you can create a unique website different from other foodie blogs. Create a custom header with a brand logo and text for site recognition. Customization made easy with the Live Preview function – colors, background images, and content. Fully translatable so no audience member is left out. 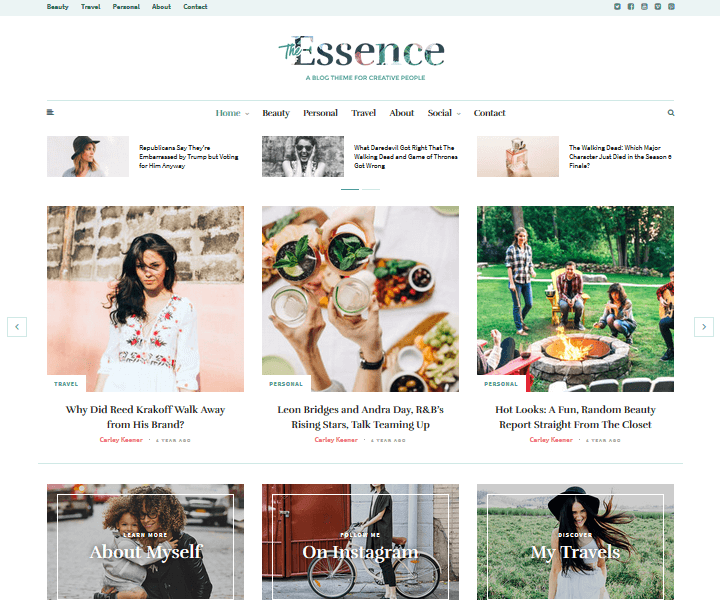 The Essence is a creative blogging theme that perfectly suits your foodie website needs. 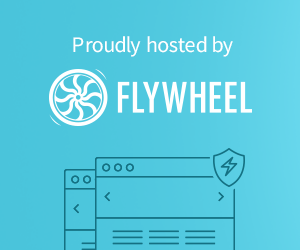 Super flexible and full of great features, this WordPress theme automatically adapts to any device your site visitor is accessing you from for the ultimate in user experience. In addition, it comes with a feminine feel to it so for those catering to a female audience can display delicate typography, pastel color schemes, and lots of stunning images for captivating a site visitor’s attention. Plus, you can garner new attention by encouraging site visitors to like and share your website and its killer content. In the end, this girly food theme is an exceptional complement to all of the delicious treats you want to share with fellow food lovers. Neptune is ideal for those looking for a way to connect with foodie lovers from all over in a stylish and extremely creative way. 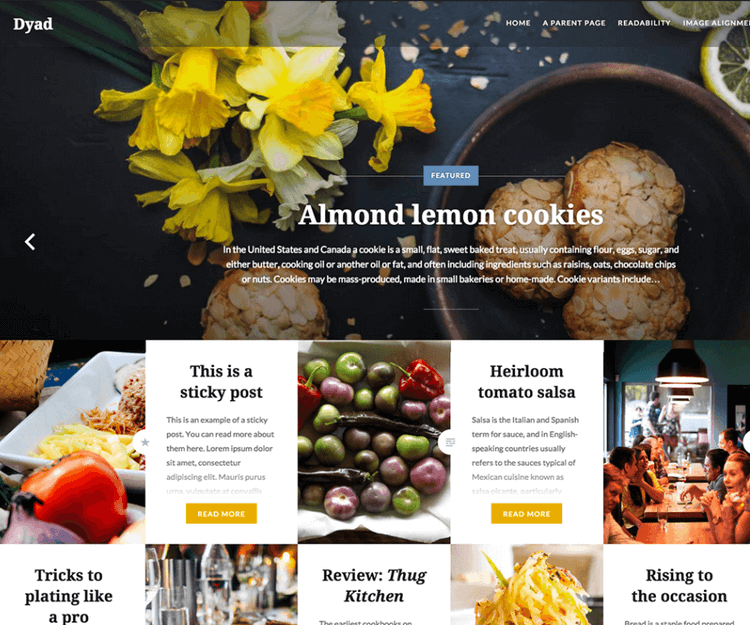 Packed with features, this food theme offers website owners a uniquely busy homepage complete with imagery, playfulness, and tons of content. Feature ingredient lists, nutritional data, and cooking steps all at once. Give your readers more to view with a beautiful related recipes block that show similar recipes or ingredients. Altogether this theme is one you will have to check out for yourself, there is simply too much to list right now. Integrated timer for those cooking along with your recipes. Exclusive Reading Mode to block out distracting content and focus on the task at hand – cooking. Choose from over 700 fonts. Live recipe search and autosuggest so your readers can get exactly what they are looking for. Smart Sidebar is sticky so your ads, recipe Meta data, and more follow your viewers. Food Blog is thought to be consistently chosen by food bloggers across the food industry. With your content getting all of the attention, Food Blog offers a photo-friendly layout, a fully responsive view, and a robust customizer so you can change every aspect of your site. Built on clean code for optimal performance, Food Blog also comes with multiple social media options, custom CSS capability, and access to several shortcodes brought to you exclusively from the theme developer. Simply put, Food Blog is definitely a go-to choice when it comes to your food blogging endeavors. Recipe Card Plugin included for building a library of recipes for your readers. Sidebar choices for making your website as minimal or creative as you wish. Recent Posts widget comes complete with beautiful thumbnail images to entice readers to explore more. Contact 7 Form plugin compatible for connecting with your viewers. Large featured images for each post so that nothing goes unnoticed. Foodica, designed for food based blogs, is minimalist in design but does not disappoint when it comes to features, especially color. With 9 color schemes to choose from you can be sure your website will match your brand. You also have access to an advanced theme options panel and visual customizer for changing fonts, layouts, and social media accounts such as Twitter and Instagram. Implement infinite scroll, create custom menus, add a logo, and even translate your content. 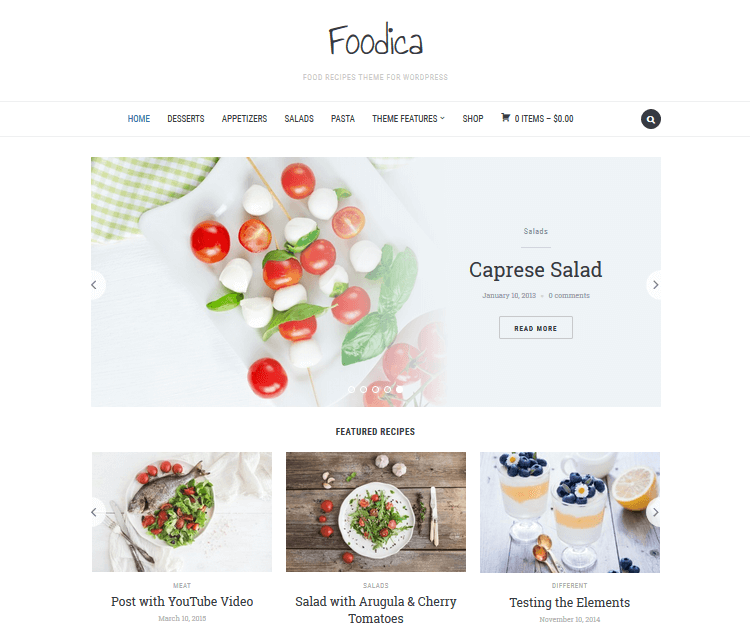 If your goal is to create a beautiful recipe gallery for those with a passion for food, as well as share your best ideas with your viewers, Foodica should be considered for your website. Multiple ad zones for banners to monetize your website. Recipe shortcodes making recipe building quick, easy, and beautiful. Widgetized sidebar area for Meta data, subscription boxes, social media icons, and more. Add a carousel slider to your header to showcase your top recipe choices. Integrate with WooCommerce if you have products to sell. iCook comes filled with features perfect for a food blog. This multipurpose food theme includes things like a filterable recipe gallery, custom recipe shortcodes, a popular recipes widget, and that’s just the beginning. Powered by the Tesla Framework, iCook has an exclusive admin tool for changing the look and functionality of your website with ease. Change your background, add a custom logo, and utilize social media platforms. 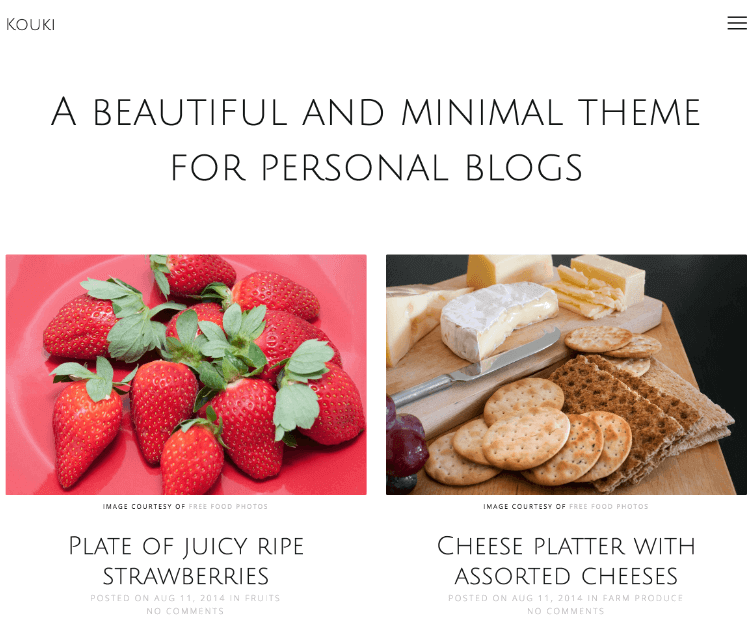 Making your food blog has never been easier using this appetizing food theme. Custom Post Types available for creating new predefined elements that can be tailored to meet your site’s needs. AJAX Contact Form included for sending instant messages without a page reload. Integrate Google Maps so you can direct your customers to your restaurant. 4 homepage templates to choose from. Cross browser optimization for reaching all of your loyal foodie fans. 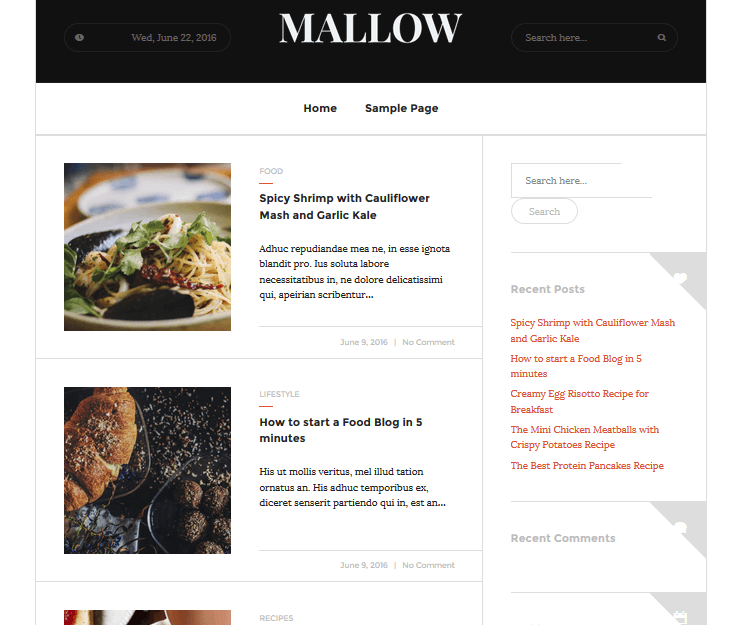 Mallow is a simple, content focused theme that would be perfect for a food blog. Large and retina ready featured post images introduce your best creations and even provide a tiny excerpt to entice readers to click and read more. If you are looking for a minimal theme that will give you a blank canvas for sharing recipes, creations, and anything else food related, put Mallow on your list of top choices. Bold backdrop image available for a great first impression. Compatible with Contact Form 7 for staying connected with your readers. Impressive featured slider to highlight your top recipes. Multiple layout options – simple blog or portfolio layout. All major browsers supported so visitors can click and see your site without a hitch, every time. Dyad is a modern food theme with a stylish and balanced layout. With each post displaying a featured image, paired with a blog excerpt, your readers will be visually drawn to read more. Plus, upon clicking on your website, visitors will be greeted with a large featured image spanning the length of your header that can be designed as a featured content slider as well. This opens the possibility to showcase your top food posts in a bold way. Infinite scroll possibility for readers to check it all out. Sticky post option to keep your best content nearby. Translation ready for foodies across the globe. Threaded comments so everyone can chime in about their favorite recipes. Custom Menus in the header and footer for easy navigation and social sharing. Kouki is a basic theme perfect for food bloggers that are looking to display simple images and minimal content. Using plenty of whitespace, Kouki highlights what you want your readers to see. Beautiful typography, large featured images, and a hidden navigation menu provide a distraction free space for showing off your food creations. Using the Live Theme Customizer change color schemes and add Google fonts to match your style. Fully responsive and looks great on all devices, no matter how big or small. Social icons included for expanding your blog’s reach and making everyone hungry for more. Masonry style gallery option for combining elegant food images. 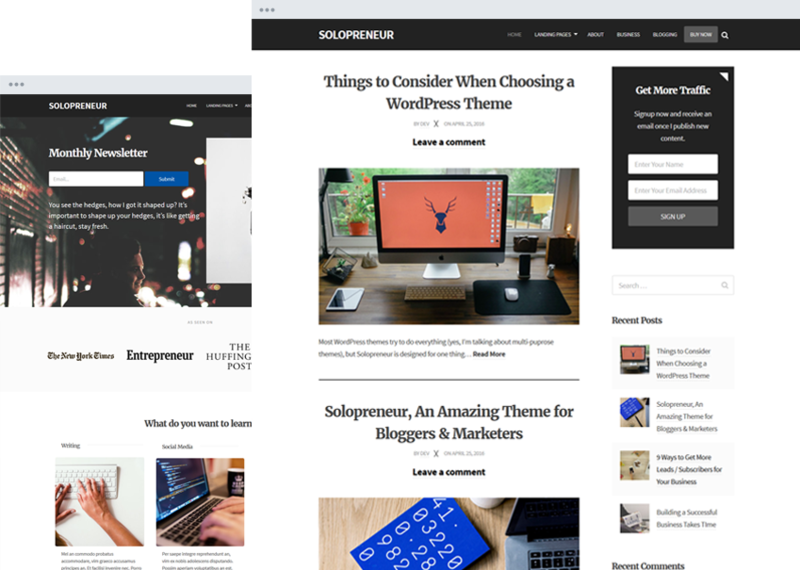 Two columns, no sidebar – the perfect layout for focusing on content. 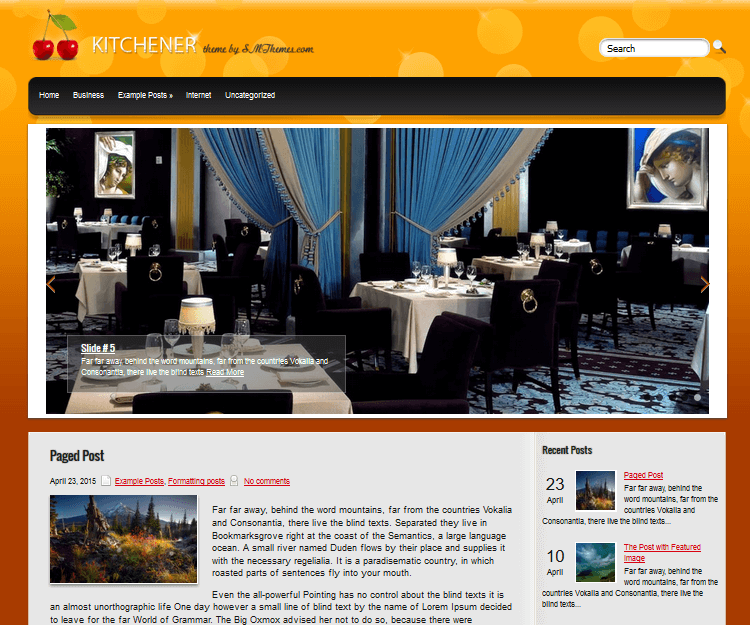 Kitchener is the chef’s special when it comes to WordPress food themes. Boasting warm orange tones reminiscent of cooking with your grandma, Kitchener gives your website energy and zest, with a bit of nostalgia. A large featured post image linking to your favorite blog post encourages site visitors to explore what you have to offer. It also comes slider ready, fully responsive, and SEO optimized so you get found and followed. WooCommerce compatible for those selling cookbooks and kitchenware. Google Maps shortcode included for those with a brick-and-mortar restaurant. Exclusive Sharebar box so visitors can share what they like with others. Dynamic content loading for readers to see all of your content without page reloading. Multicolored related posts for a better user experience and increased reader engagement. 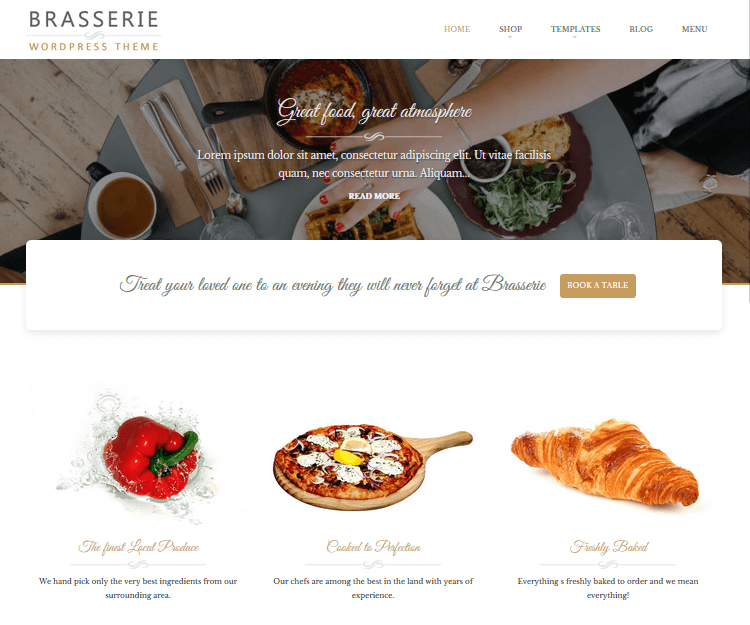 Brasserie is a simple to set up food theme with tons of features for the creative blogger. Add your own personal logo, include social media buttons, and enjoy unlimited colors and Google font options. Want to sell your cookbook, cakes, or set up restaurant orders? Do it seamlessly with WooCommerce integration and boost those sales. Add a full-width header image to strike a great first impression. Choose from 4 different homepage layouts for the perfect web design. Add an image slider to display your top recipes, special deals, or link to your favorite cooking stories. Fully responsive to reach your entire target audience no matter where they access your site from. Translate your site to expand your global presence and make a name for yourself worldwide. So there you have it! A list of some of the tastiest food WordPress themes out there that can fit anyone’s budget. If you are looking for a great food theme to complement your appetizing content and mouth-watering imagery, try some of the themes mentioned above and get cooking! Have you used any of the above mentioned food WordPress themes for your website? Have I left one off of the list that you feel should have been included? I would love to hear all about it in the comments below. nice collection . But still Searching . Hey, if you could provide what you are specifically looking for, I might be able to help. Here’s another collection of top food blog themes. I purchased Foodica and I am not happy. I don’t feel I have a handle on how to customize it. I am not techy so each step of customization is like walking on hot coals for me. It takes hours and I am not happy with the result. I think I need help, but most designers want a fortune. I am saving up. Any advice for me? Look for a theme called KALE. 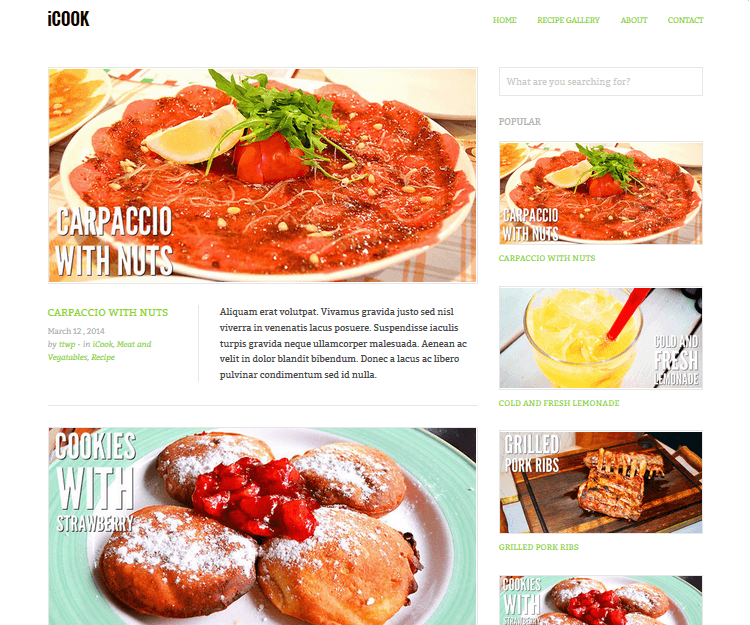 It’s one of the best, if not the best Food / Recipe sharing wp theme. 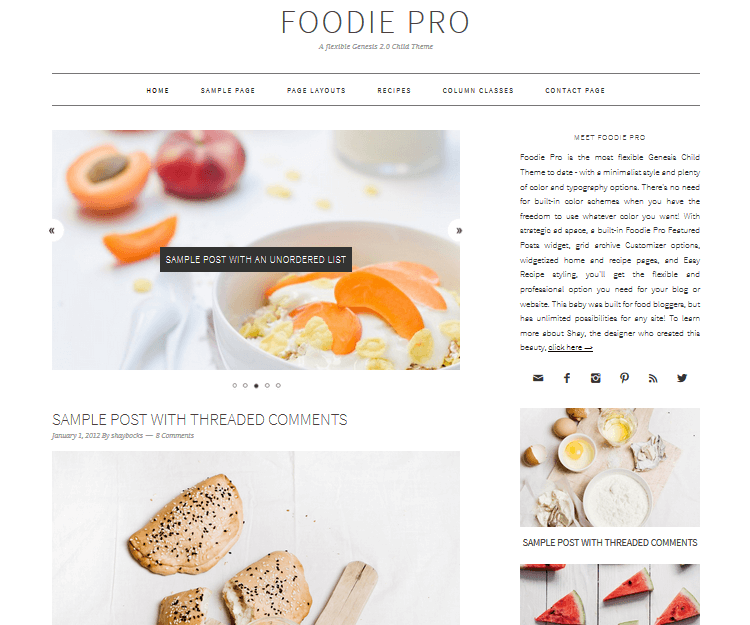 I also tried Foodie Pro and a few more themes and I was almost ready to give up on my blog. I gave it a one last go and tried a free theme on WordPress.org and I absolutely love it. It is easy to use and their support is fantastic. I ended up buying the pro version because of their support. They went above and beyond to help me set up my blog. Are all these prices one time or is it a subscription model? This information has really helped me to choose a theme that will be of value for my blog. Thanks for the insights. I hope next time we get new few things.